Taking it day by day now, I'm not promising to do any challenges at this moment in time... :) I wasn't supposed to do any strenuous exercise for a week after the tooth pulling (I did do yoga once though), so after a week had passed, I decided I missed strength training and decided to do the first workout of "New Rules of Lifting for Women". Wow, what a difference, it was really difficult for me since I haven't been strength training consistently. But at the same time it felt amazing and I am looking forward to including that back into my routine. I am traveling for work starting tomorrow and am packing my gym clothes! Now to address the topic of this post... today's breakfast recipe. A 2 lb container of strawberries were on sale at Safeway last week, so I've been eating strawberries almost every day. I sliced up a bunch of them and have been using them on Greek yogurt and oatmeal. Yummy! 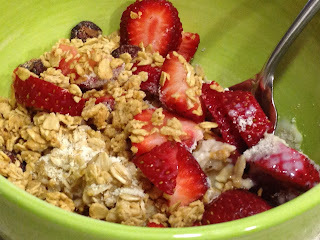 Today I made a delicious bowl of oatmeal with unsweetened coconut milk, vanilla protein powder, about 6 strawberries and added some granola (Open Nature Cranberry Nut Goodness). This protein infused take on oatmeal tasted great and lasted me well until lunchtime. - Add ingredients and enjoy! I love coconut milk now! It's so flavorful! It's not great for my blood type though... If you follow blood type diet at all.